60 days learning at a tax law firm that is striving to do everything better. My first day at Counter Tax Lawyers was like a movie trailer that makes you mark your calendar for the release date: fun, action packed, and exciting. And it didn’t disappoint. 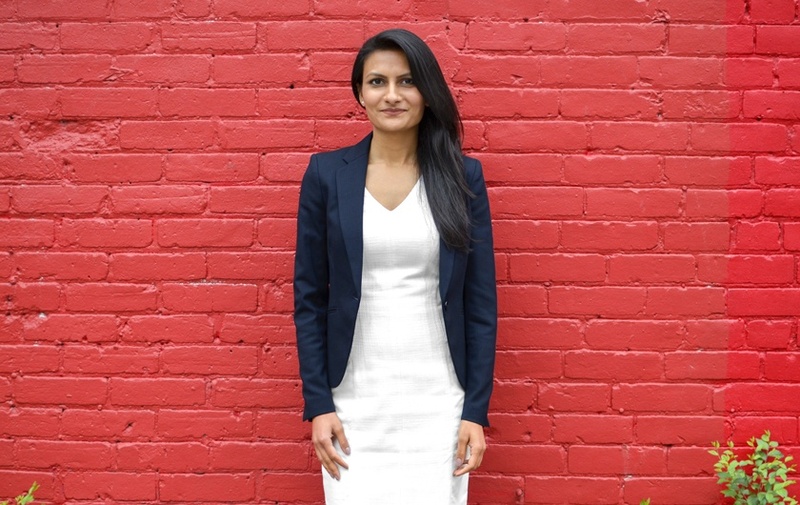 Most law students start a job learning the ins and outs of their new law firm. I leapt straight into learning about the opportunities in contemporary legal practice. I attended the Legal Innovators Roundtable, a monthly event where a small group of like-minded lawyers gather to exchange ideas about the future of the profession and ways to effect change. Little did I know that among the people Counter considers “like-minded,” I would find Tobias Degsell, an innovation consultant with Combiner and the day’s key speaker – and a bionic human. 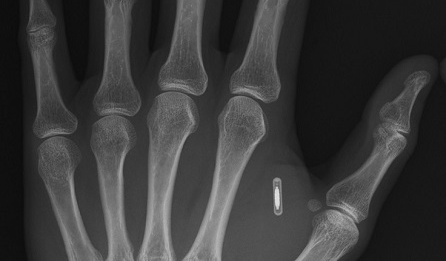 Seriously: he has a chip for his keys, his gym tag, and his bitcoins embedded in his hand. He talked about risk and creativity and tried to show how law practices can incorporate some change, especially when it comes to using technology as an advantage. That kind of creativity, I learned, is available in abundance at Counter. Lest anyone fall into any ruts, the company practices HotDesking, a practice that forces you to uproot yourself and shuffle to a new desk every day. Why HotDesking, you ask? It contributes to a collaborative environment, reduces status differences, and fosters deeper relationships. Counter believes that culture drives results, and part of developing a fun and empowering culture is apparently distributing Yoni’s annoyingly loud and speedy typing equally among everyone in the firm. But that is only the most superficial sign of Counter’s openness to change. In reality, the firm's creativity runs deep, as I came to learn over the subsequent weeks. The people at Counter come from diverse backgrounds, and everyone thinks very differently, both from each other and from other people in the profession. 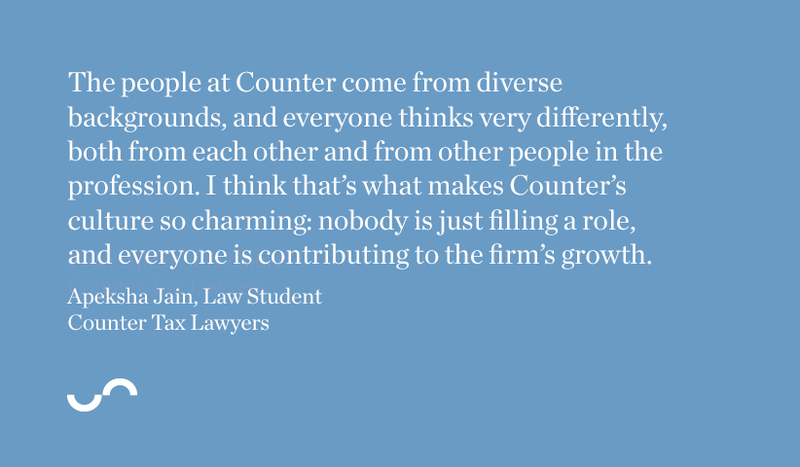 I think that’s what makes Counter’s culture so charming: nobody is just filling a role, and everyone is contributing to the firm’s growth. There’s an intentional lack of hierarchy that makes it really easy to share your ideas, and with so many inspired people in the room, your ideas will often end up having a real impact. I was comfortable the minute I stepped in, and I never felt like I had to be anything other than my weird self in order to fit in. I have also appreciated the real inventiveness that Counter lawyers bring to their work. While some people think that tax law is black and white, holding strict to the letter of the law, Peter, Natalie, and Yoni always find unconventional ways to approach legal challenges, and I’ve learned a lot from watching them do it. Getting to do case research has been some of my most exciting work because I’ve gotten to dig into some really stimulating issues. I also contributed to the corporate residence and tax-dispute settlement articles that Counter is writing for Thomson Reuters. Not every law student – or lawyer, for that matter – can claim publication of that calibre, and I’m pretty excited to own all the bragging rights as I enter my final year of law school. From the macarons, Starbucks, and welcome breakfast that I got on my first day to all the learning opportunities I got every day after, I couldn’t have asked for a better summer. I’m probably going to start questioning all my classmates’ underlying assumptions because that’s what Counter has taught me: always ask why and always strive for better.